My foray into writing about and reporting on technology began in 1997 while I was working as a freelance radio reporter in San Francisco. A colleague knew I was looking for additional work and introduced me to a small marketing company in need of someone who could pitch stories to newspaper editors. They were handling a product from a Los Gatos company called SoloPoint. The device essentially enabled the control of a phone via a personal computer. By today’s standards it was simplistic, but I was fortunate to have a phone call with an industry analyst to get better acquainted with it and learn about the lofty heights the SoloPoint technology road map pointed to. Our conversation drifted from the SoloPoint solution to the future of telephony – a future where cell phones would become mini computers more powerful than PCs at the time. That experience led to covering technology for commercial news radio, starting a business news operation at KBZS-AM in San Francisco, and reporting for NPR for several years. Concurrently in 2005 my friend Tony Perkins, the founder of Red Herring magazine, had begun to develop his next project called AlwaysOn. I had been thinking of helping him with the online audio and video piece of the website, but Tony realized it might be awhile until it would be built. So, he introduced me to John Furrier who had started a company called Podtech. 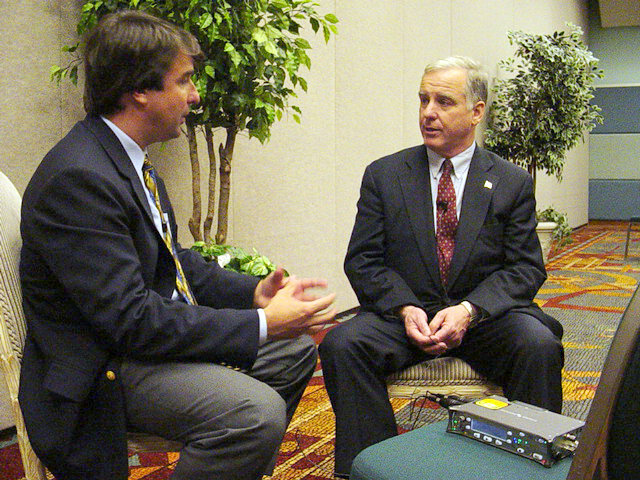 John Furrier interviewing Howard Dean at TiEcon in 2006. John began doing audio interviews and blogging as a way to get noticed in the job market. But he has a keen sense for something that has “it” and realized there was more to online media than just posting interviews. He already had exerted a constructive influence on Mike Arrington’s early development of TechCrunch, and John saw the audio realm as something he could run with. When I joined Podtech at the end of 2005 he was courting venture capitalists to fund the expansion of his many ideas. Originally I envisioned a platform for freelance journalists to create accounts, upload assets and work on stories. But it was Podtech’s marketing services (called Podtech Pro) for large clients that prospered. From 2006 to 2008 my team, made up of professional broadcast writers and reporters, developed several successful online content strategies for Silicon Valley clients. We were essentially an agency within Podtech while the greater company was tasked with coming up with the next hot Internet thing. Podtech functioned like a social media laboratory. Robert Scoble seemingly interviewed every player in Silicon Valley and tried every device and app he could get his hands on. Jeremiah Owyang was imagining how social media could help companies work better together. Steve Gillmor as his unapologetic self saw social media’s proper role as gadfly. He created a video, interviewing salesforce.com’s CEO Marc Benioff among others, sprinkled with profanity. Steve showed he knew a lot more about edginess in media than anyone else in the company. Benioff later hired him. Although Podtech received a lot of flack for some of its less-than-appealing video programs on its network, many of our 3rd party producers were nationally recognized writers and creators. Tom Foremski had been writing from Silicon Valley for the Financial Times when I had been reporting daily for NPR. We had never met in those capacities but at Podtech I heard him say, for the first time, “every company is a media company.” Larry Magid of CBS News radio, whom I had previously bumped into at technology events, began producing at Podtech. And I remember like it was this morning, John Furrier watching a Loren Feldman “1938 Media” commentary and there in the offices of USVP on a beautiful California morning he called Loren to recruit him into the network. I don’t know why it sticks in my mind but perhaps it’s because of the effortlessness in Furrier’s ability to make those connections. The talent at Podtech was, to use a very overused word these days but appropriate in this case, amazing. On my team: Michael Johnson, a production guru with NPR and a creative genius; Catherine Girardeau, a master storyteller who had been a lead producer at Antenna Audio in the Marin headlands (if you’ve ever used an audio tour in a museum anywhere in the world chances are you’ve heard her work); Paul Lancour, a media wizard from KQED-FM in San Francisco who can do anything in front of or behind the camera; Patrick Haynes, a videographer able to work with any equipment under any conditions and make professional images. Taken at the RSA Conference in 2007, from front to back: Vera Yu, Catherine Girardeau, Jason Lopez, Patrick Haynes (r) and Michael Johnson (l). Kevin Edwards, our architect now at Connected Social Media, was on the Podtech software team and central to the platform. He had been the first graduate at NYU to earn dual degrees in film production and computer science, and had been one of the early hires at CNET. There’s a lot of conjecture on the web from web pundits about how social media works and what will happen, but Kevin sees it under the hood from the code to the actual download or page view. He’s like a designer who also rolls up his sleeves and works on the manufacturing floor. A little known fact about him: Kevin once worked for McDonnell Douglas on an assembly crew building passenger jets. Darold Massaro, Connected Social Media’s President, grew up in Silicon Valley steeped in technology development. His father was a key figure in the creation of the 5.25 inch floppy disk drive at Shugart Associates, and then at Xerox persuaded the company to make an investment in Steve Jobs’ Apple Computer firm. At Podtech Darold was instrumental in establishing some order in the chaos of ideas, helping to clarify what the web was and was not disrupting and what the technology could and couldn’t do. As an example of how far the advances have come, Darold is running Connected Social Media from his boat as he and his family fulfill a life-long dream of sailing around the world. There were numerous creative tensions in such a milieu of practice, theory, and entrepreneurship. In the end, however, creating the next online juggernaut was not to be. The VCs pulled funding, Podtech’s assets were sold, and the second incarnation of the firm failed, but not until a handful of us doing the agency work in Podtech Pro made a commitment to finish client projects without compensation. We wagered that we had developed enough trust with our client project managers they would stick with us on future initiatives. They did and Connected Social Media started business in 2009. This blog is a collection of insights learned in my years in broadcasting as an on-air host, reporter, program director and station manager; and over the past 8 years immersed in social media in Silicon Valley at Podtech and Connected Social Media. I have more topics than I know what to do with but it’s my hope that I might help anyone who reads this blog and especially help prevent them from reinventing the wheel… or perhaps make an improved version of it.